Singer/songwriter Richard Wadsworth gives new meaning to the term “prolific.” Claiming to have created over 1,300 songs since the age of 19, his latest album, Eternity is stocked with a whopping 77 tracks. You might think that with an album which contains so many songs, the tracks themselves would be very short to compensate. That’s not the case though. The opening track, Heavenly Starway, clocks in at just over 77 minutes. The remaining 76 songs average between 3 and 5 minutes each. Wadsworth describes his music as “Christian-themed rock and roll featuring angelic vocals and gentle electric guitar strums.” Religious themes aside, musically his songs remind me a lot of obscure 90s indie folk and avant garde LoFi artists. The sound is very raw, almost like a live recording. There is very little editing. The songs consist of some rather creative strumming of out of tune guitars, with accompanying vocals in various forms and tones. The lyrics can be difficult to make out at times, but I don’t think it really matters. This is an experimental recording, so pretty much anything goes. I could find almost no info on this artist other than what is listed in the press release except that he may be from Philadelphia. There’s no website or social media presence to speak of. Eternity is one of the most bizarre recordings I’ve ever listened to, and I couldn’t help but wonder whether it was all an elaborate troll. Icy Love is probably my favorite track, though admittedly I did not listen to all 77 of them. The “album cover” is just a 19th century painting by William Rimmer titled Evening (The Fall of Day.) 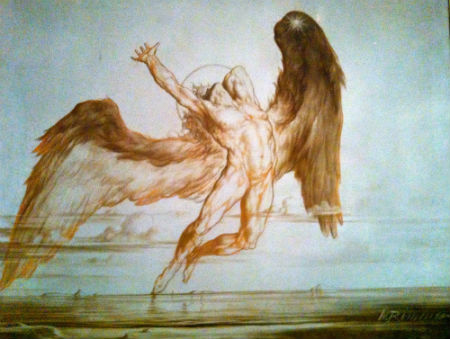 The same painting was also the basis for Led Zeppelin’s label, Swan Song. If you’ve got some time to kill, give Eternity a listen.